But She Gets So Much Attention! Why Is She Still Misbehaving? Kendra is driving you crazy! You hate to admit it, but you’re not sure what else you can do to manage her behavior. You have done a functional behavior assessment and the function is most definitely gaining the attention of those around her. Peers, adults, she really doesn’t care who's attention. She just engages in attention-seeking behavior All. The. Time! Sometimes it’s minor problems that are just so attention-seeking and annoying. When you are working with another student, Kendra will throw something and look at you and smile. You ignore it because you know it’s to gain attention, but it’s aggravating and exhausting. Have you met Matt? Matt’s FBA indicated that he would hit and kick other students and was reinforced by their negative reaction. He would laugh and jump up and down while the other student was crying. Talk about literally adding insult to injury. Sound familiar? I think we’ve all had Kendra or Matt in our class before. And funny, we might have other students whose behavior is worse in severity...but sometimes these behaviors just wear you out and are baffling. Especially when you are giving the student tons of attention to begin with! So What Do We Do About These Attention-Seeking Behaviors? For both Matt and Kendra, you have done the legwork. You have the FBA that tells you the type of attention Kendra wants is from the teacher. You have FBA data that clearly shows a pattern of gaining attention from specific people. Perhaps your student does both these things and you can’t figure out how to stop it? Here are some things to try. The reactions that we provide to students in response to their behaviors are often more reinforcing than we realize. And the same is true if the attention comes from peers. Essentially it's a kind of power, even when we are trying not to react. These students can have a big effect on their environment with negative behavior. The old adage that if we just increase positive behavior we have less negative behavior is true to a point. But it doesn’t always work with this type of behavior. Challenging behavior to gain negative attention has 3 significant advantages over positive behavior that you are trying to provide lots of attention to. Negative behavior is often more consistent at getting a significant reaction than positive behavior. Even when we are trying to reinforce positive behavior, we consistently have to intervene for some negative behaviors that might harm someone but not for the positive. So the negative behavior is more consistently getting a reaction. Even when we are trying to make sure that we attend to positive behavior, the magnitude of our response is typically not the same level as that provided to keep a student from hurting themselves or someone else. The students have a longer history with using the negative behavior to get a reaction than the positive. So, it's probably an easier pattern for them to follow and is their automatic response. All of this means that the negative behavior naturally gets a reaction more efficiently than positive behavior, Efficiency is made up of how easy it is (learning history), how predictable it is (consistency) and how reinforcing it is (magnitude). And that is why it persists despite our efforts. Of course it depends on the student and knowing as much information as possible from the FBA will be helpful in determining an individual response. However, here are some general ideas to try that can help. Give HUUUUGE reactions to positive behaviors that stop the whole class in their tracks (much like a crisis would but positively). We used to sing For He's a Jolly Good Fellow (the whole class would stop and sing) when a student got all his tokens. And it worked because it was everybody and ALL the attention was on him. Make sure you have a replacement behavior in place, like asking for attention, that gets them that big reaction from #1. Kendra needs to be in control over getting the attention, not just accept it when it comes her way. Hers is a little easier because you can set up situations where she can ask for attention by calling your name and get it consistently at a high magnitude. Matt needs skills to get other kids attending to him for appropriate behavior that is more consistent than the response for negative behavior. His situation is a bit more complex than Kendra because it involves the other students. You may need to train a subset of other students to be his buddy and respond to the right behavior with a huge amount of attention. And to not respond as much as possible to the negative behavior. Remember that you have to get the replacement behaviors happening as easily as the negative behavior and you’ll have to make the reinforcer even more powerful to do that. You also want to make sure that your replacement behavior clearly serves the same function as the challenging behavior. If you are an Academy member, the Functional Communication Training workshop might be helpful. 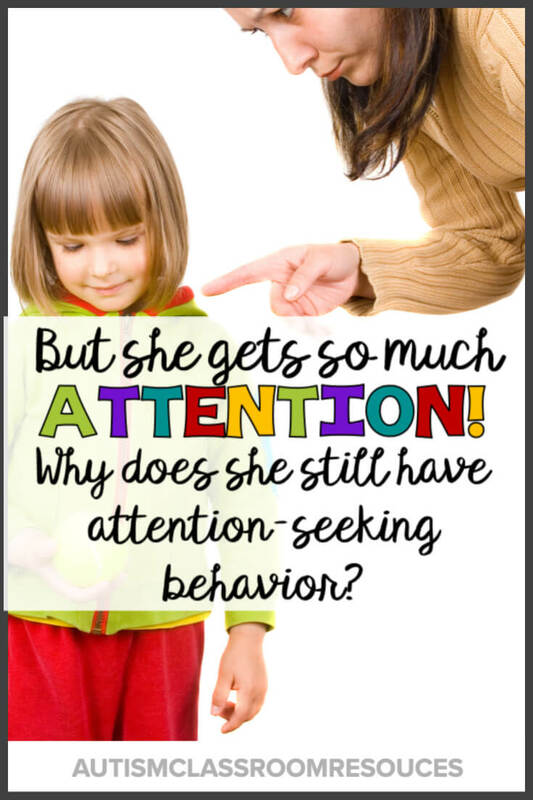 Rather than simply increasing the amount of attention the student receives, replacement behaviors allow the student to get that attention when HE or SHE wants it….not when we think they need it. In order to really boost those replacement behaviors, though, we have to make sure that the response they get--the attention they get--is really consistent. And that means that the positive behaviors result in big reactions as consistently as negative behaviors. When you do that, though, keep in mind that you are teaching--you are teaching the student how to manage his or her own behavior. You are teaching the student to communicate for what he or she needs. And you are teaching more appropriate behavior. It may mean the math doesn’t get done for a while….but the behavior is what is going to make the biggest impact on the student’s outcome. In addition to teaching appropriate ways to gain attention, we have to highlight the giving attention for that and not giving attention for negative behaviors. But this can be tough to do for kids like Matt whose behavior impacts other students in the class. How do you keep from sending the messages that Matt’s behavior is OK but not attend to it? Give your attention to the kid who deserves it….the student that Matt hit or kicked. Make a big fuss over that student, even if it isn’t required. Say the messages you want the class to learn to that student (e.g., “I’m sorry. He shouldn’t have hit you.”) If you attended to Matt, it would only increase these behaviors in the future, because it’s reinforcing it. But to just ignore it wouldn’t make sense to the rest of the students. Attending to the victim sends the message about who gets the attention. Does that mean that I will always have to be paying attention to Kendra? No, it doesn’t. It might mean that for a the short term while we teach the skill. But then we can teach Kendra to wait for your attention. You can find out more about teaching attention-seeking communication and waiting in this post. None of these solutions will change the behavior overnight. And it’s likely that you’ll get pushback and worse behavior before it gets better. But, you can put strategies in place to positively and effectively reduce attention-seeking behavior without “just” ignoring it. Oh, and whatever you choose to do, do it soon. Because the longer we let it go on, the harder it is to change. That reinforcement has gone on for a while and it’s a habit we have to change just like biting your nails or eating healthy foods. It’s going to take some time….but when the student can control attention, I think you’ll find that they don’t need to have it all the time. We’ve had a number of interesting discussions in the Special Educator Academy over this year and many of the questions that come up are definitely not unique to members. So I’m pulling a few of them to answer for everyone in the next few posts.